Individual elements in a scientific mosaic are relatively stable. Recall that the first law of scientific change, the law of scientific inertia, states that once a theory or method becomes part of the mosaic, it remains there, unchanged, until it is replaced by a new element. But what if we “zoom out” and consider an entire mosaic? Remember that a scientific mosaic is the set of all theories the scientific community accepts, and all methods that it employs. The mosaic of the contemporary scientific community, for instance, is extremely complex. It is made up of the countless elements accepted and employed in every particular field of empirical and formal science. While each element is relatively stable – as per the first law – ongoing scientific research ensures that the mosaic is in a state of near-constant change. Any change of any element, after all, counts as a change to the mosaic. In 2017, for instance, a study was published showing that, on average, zoologists today confirm the existence of one new species of plant or animal in the Amazon rainforest almost every other day! Even though zoology is only one part of biology, and biology is only one part of our contemporary mosaic, these frequent changes in our knowledge of Amazonian rainforest biodiversity can lead us to conclude that the mosaic itself changes almost constantly. So, while individual elements within mosaics are relatively stable, mosaics themselves change every time the community accepts a new theory or employs a new method. But if mosaics are in a state of near-constant change, what features of mosaics are stable enough to allow us to identify distinct, relatively stable “worldviews” within the flux of the process of scientific change? The Aristotelian-Medieval, Cartesian, and Newtonian mosaics all changed like our Contemporary mosaic does, but not every change in these mosaics led to a fundamental change in worldview, in the same way that the knowledge of new species in the Amazon doesn’t profoundly change our worldview today. Over the past four chapters we have defined each worldview by focusing on some central elements that are remarkably stable compared to others. These elements are the fundamental assumptions (conceptions, “isms”) you have become familiar with. Recall, for instance, hylomorphism, pluralism, teleology, plenism, monotheism, heterogeneity, or finite universe that were among the fundamental metaphysical assumptions of the Aristotelian-Medieval worldview. Or recall Cartesian mechanicism, dualism, action by contact, dualistic determinism, plenism, monotheism, homogeneity, and infinite universe. Similarly, Newtonian metaphysical assumptions included dynamism, dualism, action at a distance, dualistic determinism, vacuism, monotheism, homogeneity, and infinite universe among many others. Finally, among the contemporary metaphysical assumptions are wave-particle duality, probabilistic determinism, materialism, and agnosticism. What all of these “isms” have in common, and what we argue accounts for their greater degree of stability, is the fact that these elements are the metaphysical components of each of these mosaics. But what is metaphysics? The term metaphysics is notoriously difficult to define. For our purposes, however, a relatively simple definition will suffice: metaphysics is a set of views about the nature of the world taken as a whole. Can matter exist without mind? Can mind exist without matter? What are the essential properties of matter? Is the universe homogenous or heterogenous? Is the future of the universe strictly determined? Does the universe have boundaries in space and time? How a community answers questions like these establishes their overall worldview. A worldview is a community’s unique constellation of metaphysical components, and it characterizes how they understand the general features of the world taken as a whole. You will notice that the answers to these questions are the metaphysical components that we have used to characterize each of the four worldviews we have studied. Moreover, each worldview’s unique set of metaphysical components acts as something of a “signature”. For instance, any community that accepts hylomorphism, pluralism, plenism, and teleology shares the same basic worldview as the Aristotelian-Medieval, which is substantially different from the Contemporary worldview. How do we determine a community’s answers to these metaphysical questions? Or, put another way, how would someone studying the history of science identify the metaphysical components of a community’s mosaic? The task can be relatively straightforward in communities who explicitly include metaphysics in their mosaics. That is, in some communities, metaphysics is recognized as a science alongside other sciences like physics or mathematics, and their attempt to articulate their own worldview is brought into direct conversation with these other sciences. Again, that is to say, in some communities their metaphysical commitments are explicit, or outwardly expressed and articulated, as part of the science of metaphysics. The Aristotelian-Medieval and Cartesian mosaics are excellent examples of mosaics where the metaphysical components are explicitly stated. What evidence do we have for this? In the case of the Aristotelian-Medieval community, it is well-established that metaphysics was essential to the curricula of the typical medieval or early modern university. Since metaphysics was taken as a legitimate discipline that attempts to unearth the most general features of the world, and since its findings were accepted, metaphysics can be said to be part of their scientific mosaic. After progressing through three foundational disciplines of the so-called trivium – grammar, logic, and rhetoric – students working towards a degree would then progress from physics (or natural philosophy), to metaphysics, and then to moral philosophy. As we have also seen, such metaphysical components as teleology and hylomorphism were essential for understanding even the basics of Aristotelian-Medieval physics. Similarly, because most of the features of the Cartesian mosaic blossomed from the works of René Descartes himself, and his foundational texts explicitly establish such metaphysical views as dualism and the essential properties of matter, these metaphysical commitments were made explicit in texts of Cartesian science. Similar to medieval universities, universities which adopted the Cartesian mosaic also explicitly included metaphysics as part of their curriculum. In cases where metaphysics is explicit in the mosaic, determining that mosaic’s metaphysical components can be as simple as consulting textbooks and scholarly writings from that community. This being said, even in communities where metaphysics is explicitly part of the mosaic, there might still be some metaphysical components that are not explicitly formulated, and that we would need to reconstruct ourselves by analysing relevant materials. That is, sometimes a community’s metaphysical views are implicit in their mosaic. In order to understand how a community would answer metaphysical questions which they themselves never openly asked or sought to answer, we need to do the work of explicating the metaphysical assumptions that are “folded into” their other accepted theories. For some communities, most of their mosaic’s metaphysical components are implicit, or simply assumed. In these cases, the task of uncovering the metaphysical foundations of their worldview falls to historians and philosophers of science like us. For example, by the early nineteenth century, the mosaics of most communities no longer contained explicit statements of their metaphysics. Thus, we can hardly find any explicit metaphysics in a typical Newtonian mosaic of the nineteenth century. The same goes for our contemporary mosaic: consult any of your science textbooks, and chances are you wouldn’t find any explicit statement of such metaphysical components as probabilistic determinism or materialism. Again, this does not mean that these mosaics have no metaphysical components whatsoever. It simply means that these communities no longer consider the task of explicating those metaphysical components a part of science itself. This can be due to a number of factors, but the most straightforward is a change in their method’s demarcation criteria (see chapter 6). But as you’ve seen in chapters 9 and 10, we were still able to explicate a good number of metaphysical components from both the Newtonian and Contemporary communities’ mosaics despite these challenges. In order to do so, we looked at sets of accepted scientific theories in each mosaic and determined what assumptions all those theories seemed to share. Remember, metaphysics (as we’ve defined it) is a set of views of the world taken as a whole. Therefore, our goal when looking at these theories is to see whether the theories themselves point to a single answer to one of those general metaphysical questions we asked above. In the case of the Newtonian community, for instance, we could ask: Based on the fact that the Newtonians accepted Coulomb’s law of electrostatics, and Newton’s law of universal gravitation, how would they answer the question “Is action at a distance possible?”. In the case of Coulomb’s law of electrostatics, which describes the force between two particles charged with static electricity, the attractive or repulsive force (|F|) between the two particles (whose charges are represented by q1 and q2) at any distance (r) can be calculated accurately without formally representing any mediating agent between them. Indeed, while Coulomb’s constant (ke) might change its value depending on the medium between the point charges, the formula works just as well when there is no medium between them (i.e. a vacuum). This is similar in Newton’s law of gravity, where F is the force of gravity between two objects with masses m1 and m2 at a certain distance r, and G is Newton’s gravitational constant. The force due to gravity alone can be calculated without accounting for any material between the objects. These two major theories, accepted by a typical nineteenth-century Newtonian community, both postulate that the electrostatic and gravitational forces exist even if there is no medium between the objects in question. Since both of these theories share this assumption, we can deduce a general metaphysical principle from it: that action at a distance is possible. Thus, we can conclude that Newtonians would answer yes to the question “Is action at a distance possible?”. Sometimes making such generalizations presents considerable difficulties. Recall that in chapter 10 we noted the reasons why a number of metaphysical components of the Contemporary worldview are difficult to identify; it’s unclear whether our scientific community accepts vacuism, action at a distance, or an infinite universe. While you can revisit chapter 10 to see precisely why we have trouble pinpointing the metaphysical components that are part of today’s worldview, we can also frame this difficulty in terms of the topic of this chapter: without the benefit of a broader historical perspective, it is difficult to ascertain whether some theories today are accepted, and this subsequently makes it difficult to explicate the implicit assumptions folded into today’s theories. Hopefully with more time and research we will soon be able to understand where today’s scientific community stands with regard to these particular metaphysical questions. In any event, we can conclude that regardless of whether the metaphysical components are made explicit or left implicit, they do shape the overall worldview of a community. This is all to say that metaphysical components – both implicit and explicit – seem to play an ineliminable role in the process of scientific change itself, whether we want to admit it or not! So far, we’ve discussed what metaphysics is and what a mosaic’s metaphysical components are, how they contribute to a community’s worldview, and how we might uncover these components when they are explicit and implicit. In order to shed some light on why metaphysics might not be explicit in all mosaics, we will now briefly explore the possible relationships that exist between metaphysics and the rest of the empirical sciences. Let us start by asking: can there even be any legitimate metaphysics? In other words, can we ever know anything about the world taken as a whole? Historically, there have been philosophers who explicitly denied that metaphysics is possible at all. For instance, by the turn of the 20th century, some scientists and philosophers – known as the logical positivists – argued that only science could be legitimately considered knowledge, since only science is capable of empirical verification. Scientific theories are verifiable because they refer to things that can, at least in principle, be observed or experimented with. This goes for all empirical sciences – both natural and social. As for metaphysics, according to logical positivists, it doesn’t refer to anything that can be observed, even in principle. As such, all metaphysical “isms” are, in the logical positivist view, complete nonsense. The positivists therefore not only rejected metaphysics as a science, but they considered it a threat to knowledge itself. We can call this conception anti-metaphysical science. This idea can be traced back to the eighteenth century German philosopher Immanuel Kant, who famously argued that we can never know things as they actually are (what he called noumena) but could only have certain knowledge about the things as they appear to us (what he called phenomena). But knowing the general features of the mind-independent world is precisely the task of metaphysics. Thus, Kant concludes that there can be no metaphysics whatsoever. 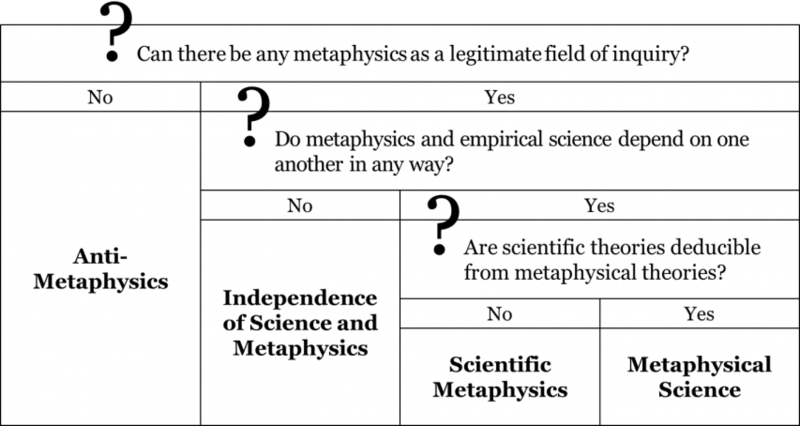 Do metaphysics and empirical science depend on one another, or are they completely independent? Some philosophers seem to have accepted that empirical science and metaphysics are utterly independent from one another, while others have maintained that they are intimately related. Let us consider both of these views in turn. According to some philosophers, both empirical science and metaphysics have their own distinct domains and are independent of one another. On this view, scientific theories merely provide us with knowledge of this or that aspect of the world, without presupposing any single view on the world taken as a whole. In other words, physical, biological, or sociological theories do not bring any implicit metaphysics with them. For instance, Newton’s law of universal gravitation, it is argued, merely captures a specific relation between the force of gravity, the masses of bodies and the distance between them. It says nothing about the possibility or impossibility of action at a distance. Similarly, according to the champions of this view, our contemporary quantum physics only tells us how subatomic particles behave, but it says nothing about any general features of matter such as its dual wave-particle nature. The motivation underlying this view is the fact that the same theory can receive many different metaphysical interpretations. Quantum mechanics has famously received a whole variety of different interpretations, each accepting the same set of equations, but differing drastically in their metaphysical views about the world and its general features. For instance, while some scientists and philosophers interpret the equations of quantum mechanics as suggesting the view of probabilistic determinism, others argue that the same equations can be interpreted in line with the view of strict determinism. Thus, it is argued, the question of the general features of the world are to be settled by metaphysicians alone without much reliance on the findings of empirical science, for the latter can often be interpreted in multiple ways and are therefore no guide in adjudicating between different metaphysical conceptions. In short, these philosophers champion the independence of science and metaphysics. What this position seems to ignore is that often scientific theories already come with a certain metaphysical interpretation built into their very core. It is true that the same set of equations can be interpreted very differently depending on the meaning we assign to their variables. However, it would be wrong to argue that all scientists care about is their equations. In fact, empirical theories are not just their equations, but the equations understood in a certain way. For example, the idea of action at a distance was an essential part of the accepted Newtonian view of the force of gravity. Without such an interpretation, the equation would remain purely mathematical and would belong to formal rather than empirical science. Thus, in order for the law of universal gravitation to be an empirical statement about the world we inhabit, it has to have some interpretation. Can we, in principle, provide the law of universal gravitation with a different interpretation? Yes, we can. In this the proponents of the independence of science and metaphysics are correct. Yet, historically, empirical theories are always accepted with some interpretation, otherwise they would be pure equations and would remain formal theories, such as those of mathematics and logic. In addition, in many instances, separating a theory from its metaphysical assumptions is not only difficult but also ignores the context of the specific mosaic in which it was accepted historically. Thus, a typical Newtonian community would accept the law of universal gravitation as stating that objects with mass attract each other at a distance via the force of gravity. In other words, the law itself and its metaphysical interpretation were accepted as an inseparable package. Therefore, the question is not how a certain equation can be interpreted in principle, but how it has actually been interpreted and accepted by different communities at different times. The idea that empirical science and metaphysics are intrinsically linked has had its champions since antiquity. Aristotle famously believed that natural philosophy (physics) and metaphysics are part of the same enterprise of understanding the world. According to Aristotle, any inquiry begins with the identification of the most common features of the object under study – the so-called first principles. Once these most common features are intuitively grasped and formulated as axioms, then one can proceed with deducing the more specific features of an object under study from these general axioms. This is a natural consequence of his method of intuition schooled by experience. It is for this reason that Aristotle used the term first philosophy to denote what we call metaphysics. It is the first, because that is where any scientific inquiry starts. For example, first we need to appreciate that every substance can be analytically decomposed into its form and matter; this is the idea of hylomorphism we discussed in chapter 8. Once hylomorphism is grasped and taken as an axiom, we can then deduce that humans can be thought of as having both a body (matter) and a soul (form). We can then apply the idea of hylomorphism to all living things. Finally, we can also explore the relations between form and matter in all sort of inorganic substances, such as rocks or chairs. This position can be titled metaphysical science, as it assumes that specific scientific theories can be somehow deduced from general metaphysical principles, such hylomorphism, plenism, or pluralism. It is safe to say that the idea of metaphysical science was also accepted by Descartes and his followers. Recall how Descartes starts by identifying what he considered to be the most general intuitive truths, such as the idea that the doubting mind necessary exists (the cogito), that God exists, or that extension is the indispensable attribute of matter. Having established these and other fundamental principles as the axioms of his system, Descartes then attempts to deduce from them a whole system of the world, including his physics, optics, biology, psychology, and so on. Once again, this is yet another example of the conception we called metaphysical science. Does the idea of metaphysical science hold water? Is it even possible to deduce specific scientific theories from general metaphysical assumptions? Suppose we were to somehow arrive at the metaphysical idea of action at a distance. Could we possible deduce any specific physical law from this metaphysical principle? While the idea of action at a distance is implicit in, say, the law of universal gravitation, it is strictly speaking impossible to deduce the law itself merely from the idea of action at a distance. Indeed, there is nothing in the idea of action at a distance that suggests any specific relation between masses, distance, and the force of gravity. In fact, an infinite number of hypothetical physical laws are compatible with the idea of action at a distance. For example, if we were to replace the square of the distance in the original law with the cube of the distance, the law would still imply action at a distance. So how can any specific scientific law be deduced from a general metaphysical principle? The short answer is: it cannot. This is the reason why most scientists and philosophers nowadays are very sceptical about the prospects of metaphysical science. The approach that seems to be accepted nowadays is the one that can be called scientific metaphysics. One good illustration of the idea of scientific metaphysics is the approach taken by this textbook: that the (general) metaphysical components of worldviews can be deduced from (particular) theories in a mosaic. In other words, metaphysical components are consequences of, and therefore depend upon, the empirical theories accepted in a mosaic. This constrains metaphysical speculation to within the realm of our accepted empirical theories and acknowledges that particular empirical theories always have broader ramifications for how a community conceives of the world taken as a whole. Extracting the metaphysical assumptions implicit in our accepted theories is not always an easy task. It is also the case that sometimes accepted scientific theories do not yield one specific metaphysics but offer room for interpretation and discussion. This explains why there is so much debate on how exactly this or that aspect of quantum mechanics is to be understood and what it means for our metaphysics. In some cases, there is some leeway for metaphysical interpretations, and metaphysics is not always strictly dictated by the accepted scientific theories. Thus, metaphysics can at times be relatively independent from accepted scientific theories. Nevertheless, often accepted theories come with very distinct metaphysical views implicit in them. In such cases, there is virtually no room for disagreement. Even in those cases, when accepted empirical theories do not strictly dictate one single metaphysics, they greatly constrain the set of possible metaphysical interpretations. Most of the metaphysical assumptions (the “isms”) of the four mosaics we have discussed in chapters 7-10, were in one way or another implicit in the empirical theories accepted in those four mosaics. However, we also noted that sometimes the accepted empirical theories do not come with any clear-cut answer to the fundamental metaphysical questions. Recall that we’ve had a hard time pinning down the contemporary attitudes towards the questions of plenism vs. vacuism, infinite vs. finite universe, and action by contact vs. action at a distance. We believe that the view of scientific metaphysics squares better with the actual practice of science and philosophy. That’s why we adopted this approach in this textbook. What can change a worldview? Once again, a worldview is the unique constellation of metaphysical components accepted by a community. It is the particular way that one community would answer general questions about the world taken as a whole. We began this chapter by noting that, while mosaics seem to be in a state of near-constant change, worldviews have historically enjoyed a degree of stability. For instance, we noted that while any change of any theory or method constitutes a change of the mosaic, those same changes might have little-to-no effect on the worldview. So, what can change a worldview? Perhaps changes in ontology are sufficient to change a worldview. Back in chapter 3 we defined ontology as a set of views on the types of entities and interactions that populate the world. Strictly speaking, a community’s ontology is part of its metaphysics, since ontology accounts for what entities and relations actually exist in the world. We know that communities employing the HD method don’t take changes to their accepted ontology lightly, only accepting such theories if they have met the stringent requirement of confirming their novel predictions. In February 2013, the existence of the Higgs boson (the elementary physical particle which helps to explain why some other elementary particles have mass) had still not been experimentally confirmed. Thanks to experiments at the Large Hadron Collider near Geneva, Switzerland in March 2014, the relevant novel predictions were confirmed, leading to the acceptance of the Higgs boson. The result was a change to our contemporary ontology: the scientific community then began to accept that the Higgs boson exists alongside the other elementary particles, exhibiting the wave-particle duality typical of all such elementary particles (see chapter 10). Now, since ontology is a part of metaphysics, technically any change to a community’s ontology changes its metaphysics. As such, the addition of the Higgs boson to the set of elementary particles was, indeed, a change both to contemporary ontology and metaphysics. But, interestingly, the addition of the Higgs boson to the set of elementary particles did not lead to a change in the general metaphysical component of wave-particle duality. So even if changes to the mosaic have ontological or metaphysical implications, these changes might not have any significant effect on the mosaic’s metaphysical components. For instance, if we were to someday discover that two of the elementary particles are actually one and the same, we will have effectively lessened the number of entities in our ontology. But – again – this would not affect wave-particle duality. That is, the question “What are the essential properties of matter?” would still have the same answer. But what if some of the novel predictions of superstring theory were confirmed? This currently pursued theory – which promises to unite general relativity and quantum physics – postulates that all elementary “wavicles” are really the effects of vibrations of entities called superstrings. These superstrings vibrate in multiple dimensions, which accounts for many of the qualities of wavicles, including their wave-particle duality. If scientists were able to somehow devise a way to accurately measure at the Planck scale, or to experimentally detect certain predicted supersymmetries, superstring theory could very well become accepted. Unlike the acceptance of the existence of the Higgs boson, however, superstring theory would likely affect the scientific community’s answer to the question “What are the essential properties of matter?”. With the inclusion of superstring theory in the mosaic, the metaphysical component wave-particle duality could be replaced by something like multidimensional strings. A worldview will only change if its metaphysical components change, and metaphysical components only change if the mosaic contains theories that – taken together – give us a new answer to fundamental metaphysical questions. We therefore suggest that those fundamental metaphysical questions – like “What are the essential properties of matter?” or “Can empty space exist?” – are our best guides for tracking when metaphysical components change. When considering changes in a mosaic, we can ask ourselves: does this change to the mosaic represent a new way the community answers a fundamental metaphysical question? If the change to the mosaic does not lead to a new answer, then it hasn’t replaced a metaphysical component, and therefore hasn’t changed the worldview. If the change to the mosaic does lead the community to a new answer, then it likely changes a metaphysical component, and may contribute to a change in the worldview. Clearly, it’s hard to say beforehand what specific changes in our ontology will or will not actually end up affecting our worldview. Grand transitions in worldviews are often best seen at a certain distance, i.e. with some passage of time. Understandably, scientific textbooks and encyclopedias are not going to change overnight, even after a fundamental change in worldview. That being said, we can safely assume that any such change is going to involve some underlying change in the accepted metaphysical components. To review, we identified the four worldviews focused on in this textbook by their unique constellations of metaphysical components. These metaphysical components are the scientific community’s answers to questions about the world taken as a whole. We argued that despite the popularity of the idea of the independence of science and metaphysics as well as the idea of metaphysical science, a version of scientific metaphysics – with metaphysical components deriving from the theories in a community’s mosaic – best accounts for the changes in the history of science. While many scientific changes might indeed constitute changes to scientific communities’ metaphysics and ontologies, only changes which trigger a new answer to a fundamental metaphysical question signal a change in worldview. The philosopher of science Imre Lakatos once said, “Philosophy of science without history of science is empty; history of science without philosophy of science is blind”, and we agree with him. We began this textbook with some of the most important topics in the philosophy of science, moved to an exploration of the dynamic evolution of four scientific worldviews, and in conclusion have brought this history back into explicit conversation with our philosophical investigations. Throughout the text we aimed to ensure that our approach to the philosophy of science was always informed by the history of science, and that our presentation of science’s history remained clearly and explicitly guided by our theoretical commitments. Far from blind, our historical approach is lit by the lamp of philosophy. Far from empty, our philosophy has drawn from the deep well of science’s history. Together, these introductions to the history and philosophy of science have equipped you to voyage further into the study of science, or simply to appreciate our scientific knowledge all the better. But introductory textbooks, by definition, are unable to communicate all the nuance or detail that their topics demand. This is especially true of a textbook introducing a topic so broad as the history and philosophy of science! We therefore see it as our responsibility to make some clarifications about, and indicate some limits of, this textbook’s presentation of the material, and to point the way towards promising avenues of future research. As we had an opportunity to reiterate in this chapter, individual mosaics are vastly diverse and in a state of near-constant change. The complexity of an actual scientific mosaic is therefore staggering, and the relatively simple historical snapshots that we were able to present of individual mosaics and their metaphysical components were only possible due to the incredible work done by professional historians of science. Their research involves synthesizing information from their subject’s political, social, environmental, intellectual, and technological contexts – typically from primary texts – to produce a coherent, compelling picture of their historical subject. Our simplifications and generalizations were only possible due to other historians’ labour and clarity. We limited our historical presentation principally to scientific mosaics and their changes with an emphasis on physical theories. While this narrow and unique focus was helpful and necessary, it only begins to scratch the surface of an immensely vast and limitlessly rich area of study. In the history section of this textbook we concentrated on the Aristotelian-Medieval, Cartesian, Newtonian, and Contemporary worldviews. It was important that we focus on these four worldviews for a number of reasons. First, these worldviews and their transitions have been the central focus of the History and Philosophy of Science (HPS) as a field of study, or discipline. Those of you who choose to further explore this discipline will be expected to at least have a basic understanding of the theories and methods of these communities, as well as the major figures (like Aristotle, Descartes, Newton, or Einstein) who played important roles in those communities. Second, because these worldviews have been a central focus of HPS, they are arguably also the most thoroughly researched mosaics in science’s history. Drawing from this research ensured that even our historical abstractions and generalizations were grounded in deep, nuanced traditions of scholarship. Third, because these worldviews have been so thoroughly researched, we were also able to learn from the mistakes of previous generations of scholars and to correct certain myths or narratives which we may have received in popular culture or from a more cursory understanding of science’s history. As a simple example: many introductions to science’s history fail to recognize the immense geographic reach and intellectual impact of the Cartesian worldview. We have placed the Cartesians squarely between the Aristotelian-Medieval and Newtonian worldviews, where they belong. Fourth, these worldviews are distinct from one another, transitioned clearly from one to the other, and were ultimately precursors to our Contemporary, global scientific worldview. All of these factors were important for understanding both the mechanism by which science changes, and for tracing and appreciating the genealogy of our current mosaic and worldview. But the textbook’s focus on these four worldviews might lead to undesirable misinterpretations or misunderstandings. For instance, we have not focused on these four worldviews because they are the only scientific worldviews that have existed. It is obvious that there have been numerous other scientific communities – with different worldviews – spread over the globe, and over humanity’s long history. Specifically, there have been scientific communities in other parts of the world, including Africa, Asia, Oceania, and the Americas. The mosaics produced and developed by communities in these geographic regions have been as diverse as the cultures from which they arise: accepting different theories, employing different methods, and very often having different metaphysical components. Some of these scientific communities likely developed on their own, others are historical branches of older communities and their mosaics, often contributing to lesser and greater degrees of similarity, respectively. We should therefore appreciate that the mosaics in different geographic regions and different historical periods can have drastically different accepted theories and employed methods. Consider for instance, a typical Medieval-Arabic scientific mosaic. While it would share many of its elements with that of the Aristotelian-Medieval mosaic accepted in many Christian regions, it would also considerably differ from the latter specifically in its theology. A case can be made that accepted Islamic theology shaped the respective methods of theory acceptance employed in the Medieval-Arabic mosaic, which were in many respects different from those employed in many regions of Christendom. The aforementioned importance of these four worldviews notwithstanding, they are chosen in this textbook to illustrate the laws of scientific change in action and serve as the entryway into a more globalized perspective of HPS no longer bound to a Eurocentric narrative. Rather than let you wander off into the frontiers of the history and philosophy of science, we think it is responsible to gesture to a few of the most prevalent fields exploring topics touched upon in this text and give you a taste of what to expect in each of them. The fields/disciplines are: the history of science; science & technology studies (STS); philosophy of science; and integrated HPS. Thanks to an ever-widening global perspective and the power of recent research and networking technologies, the history of science offers the opportunity to dig deeply into the stories of individuals, practices, institutions, technologies, and mosaics of an ever-growing list of epistemic communities. If you ever wondered about particular sciences that we were not able to explore in great detail – like chemistry, evolutionary biology, or medicine – chances are that excellent research is being done on the topic. Science & technology studies, often abbreviated STS, approaches science with research methods and theory grounded in anthropology and sociology. STS focuses on the social, political, and technological factors which shape science, and the ways that science, in turn, is used to shape those societies, political landscapes, and technologies. If you were ever wondering about the origins or implications of the science we covered, it might be worth looking into some STS scholarship. In addition to the main topics we introduced in this textbook, the philosophy of science is engaged in the ongoing project of seeking clarity and greater understanding of our scientific terminology and practices. There are many different ways of doing philosophy, including typical focuses like metaphysics, epistemology, and ethics. But we guarantee that if you pick any one of those focuses and combine it with your favourite science (say, the epistemology of biology, or the metaphysics of economics), the field will probably exist, and will fascinate you. Echoing Lakatos’ quote from above, we maintain that great philosophy of science is historical, and great history of science is philosophical, even if you are predisposed or drawn to one or the other. The integrated history and philosophy of science consciously attempts to tie these approaches together in a way similar to how we have in this text, allowing the best history of science to shape our philosophy and vice-versa. The growing community of scientonomy, for instance, works on developing and refining the laws of scientific change, and on reconstructing the mosaics of diverse communities through history. By uniting the history and philosophy of science in this way, scientonomists hope to reconstruct a historical “tree of knowledge” (akin to the evolutionary “tree of life”) embodying the global vision of HPS described earlier. In only a few minutes you won’t be reading this textbook anymore. Perhaps soon you will have an opportunity to actually lay on your back in some soft grass, far from city lights, and stare into the vast, dark night sky. We hope that as you marvel at the beauty of the universe, you will now also be able to appreciate the community of wonderers who came before you: women and men whose eyes beheld the same stars, and whose wonder inspired the creation of magnificent mosaics to which they contributed. In the same way that those stargazers and astronomers from ages past were driven by curiosity to understand the dynamisms and nature of the heavens, we hope that you have become curious about science’s history and philosophy and are driven to understand it better. We sincerely encourage you to follow that curiosity. Chapter 11: Worldviews: Metaphysical Components by Hakob Barseghyan, Nicholas Overgaard, and Gregory Rupik is licensed under a Creative Commons Attribution 4.0 International License, except where otherwise noted.